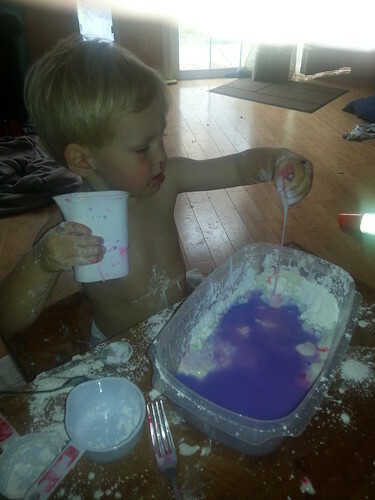 corn starch + water + gel food coloring (pink, blue, purple) + Owen – Naming a blog is harder than naming a kid. corn starch + water + gel food coloring (pink, blue, purple) + Owen, a photo by marymactavish on Flickr. This makes up for my having to remove his chocolate pudding after his unauthorized finger painting with it got it all over the rug and some toys.